Bernal Chair of Composite Materials and Structures, Professor Paul Weaver and team have been awarded the Collier Research HyperSizer/AIAA Structures Best Paper from over 500 entries. The award was presented to Professor Paul Weaver and lead author Gearóid Clancy, at the AIAA SciTech Forum, at the Manchester Grand Hyatt in San Diego, California on Thursday January 10th. The award is actually given for the work presented at last year’s Scitech Forum in January 2018 but passes through various selection committees during the year before final selection was made in November and the award presented this January. The AIAA SciTech Forum is one of the largest Aerospace conference’s in the world with 4,000 participants from almost 1,300 institutions in nearly 40 countries and more than 2,000 technical papers reporting the latest innovations in aerospace. 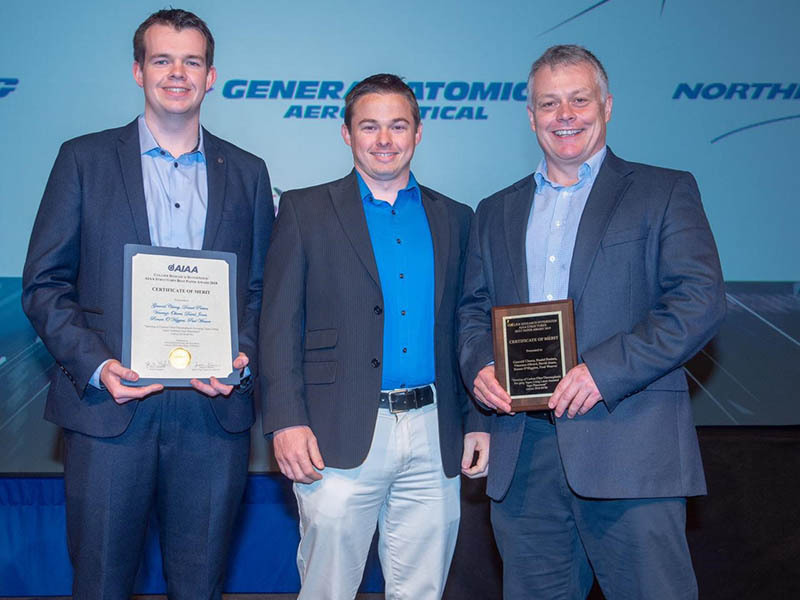 The University of Limerick now joins NASA Langley Research Centre, The DLR – German Aerospace Centre, US Airforce Research Laboratory & The University of Bristol as previous recipients of the Collier Research HyperSizer/AIAA Structures Best Paper. The paper will be listed as an award winner in the November 2018 print issue of Aerospace America and on the SciTech forum recognition webpage. The winning paper is titled “Steering of Carbon Fiber/Thermoplastic Pre-preg Tapes using Laser-Assisted Tape Placement” and was written by Gearóid Clancy, Daniël Peeters, Vincenzo Oliveri, David Jones, Ronan O’Higgins & Professor Paul Weaver. The work will enable lighter weight aircraft wing structures, lead to cost savings and, in turn leading to less fuel burn with associated environmental benefits. The work has already attracted the attention of Airbus and Boeing representatives. Professor Weaver is an authority in the field of structural mechanics for composite materials, a pioneer in the emerging field of morphing composite structures, and an expert in the structural mechanics of buckling and postbuckling of optimised composite structures. He has worked with design aspects of composite materials, for over 25 years, working with NASA Langley, Airbus UK, GE Aviation and Vestas Wind Systems. The team would like to thank Science Foundation Ireland (SFI) for funding Spatially and Temporally VARIable COMPosite Structures (VARICOMP) Grant No. (15/RP/2773) under its Research Professor programme. They would also like to acknowledge the Enterprise Ireland funded Irish Composites Centre (ICOMP) for its help with manufacturing. The Best Student Paper’ at the AIAA SciTech 2019 Forum was awarded to another member of weaver’s research team; Andrés Rivero, a final-year PhD student in the EPSRC Centre for Doctoral Training in Advanced Composites for Innovation and Science (ACCIS CDT) at the University of Bristol.